Wanna get paid to work out? You’ll have to dive deep for lifeguard certification first. It’s sink or swim trying to pass the challenging requirements, including a 300-yard swim, treading water for two minutes without your hands and a timed brick test. THE LAST TIME Kathie Flood was certified to lifeguard was in 1985. 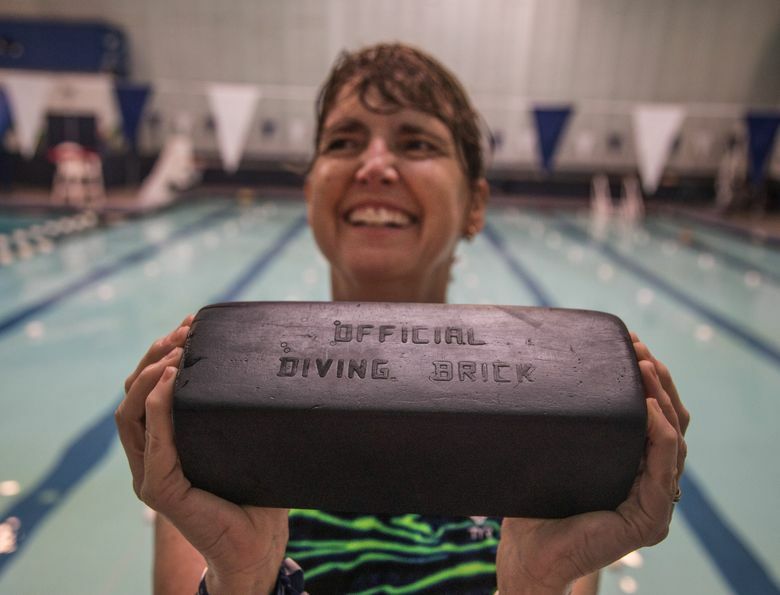 Thirty-plus years later, at 53, she became a lifeguard again. Flood is a software developer, and didn’t have plans to return to the pool, at least not to lifeguard. But last year, a friend who had been a teenage lifeguard and a college swimmer emailed Flood and said she had been recertified. She told Flood she should do it, too. Flood wanted to get back in shape. She also learned there is a national lifeguard shortage. She decided to train to see whether she could do it. The requirements sound intimidating to me, a nonswimmer, and even Flood thought swimming 300 yards without stopping sounded like a lot, especially at the beginning. It took her about three months to get back in shape. 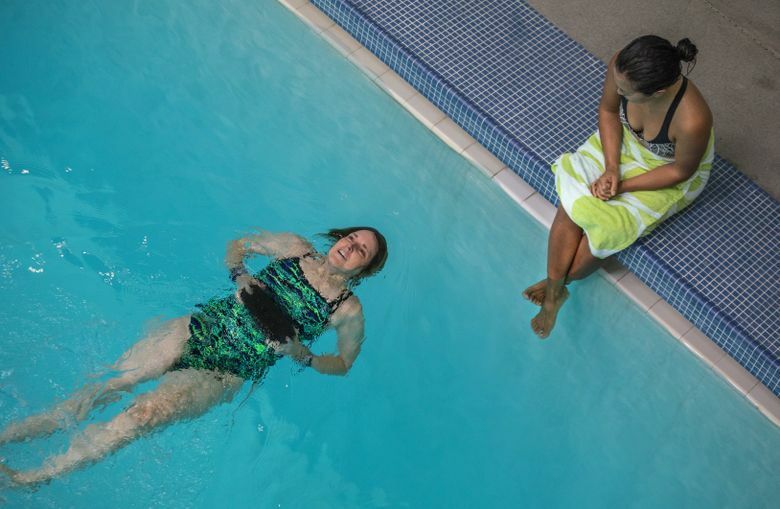 The basic requirements to attend lifeguard certification include the 300-yard swim; treading water for two minutes, hands in armpits; and a timed brick test, where you swim 20 yards, pick up a 10-pound brick at least 10 feet down, then swim back on the surface with it. I met Flood at Bellevue Aquatic Center, where she now lifeguards, so she could show me some of the basic training steps. I had no illusions I would pass a lifeguarding test, but I was willing to try a couple of things. Lifeguarding has changed since her last certification, Flood said. Lifeguards now carry floating tubes, which keep them safe while supporting someone in an emergency. She had me lie back on the tube and showed me how she can swim with it and talk to the person she’s helping. Out of the three requirements, treading water seemed most feasible to me. We went to the deep end. Treading water is supposed to use as little effort as possible, she said. Relax while you do it. Treading without your hands means treading without your arms, and using your legs to keep you afloat. Do more of a scissor kick, like the one you use swimming on your side, and keep your knees bent and legs farther apart, she told me. I attempted to scissor-kick, but when I stopped using my arms, I would sink up to my ears, face out of the water. I tried to relax and breathe, and I still needed to use my arms. At least I was still floating? Lifeguards also need to get out of the pool without using the ladder or stairs. That, I could do. I pulled myself out and sat by the pool. Ten minutes was plenty of time to practice treading water. The lifeguard manager asked whether I wanted to learn how to do water rescues. Maybe next time. Flood considers lifeguarding a paid gym membership. 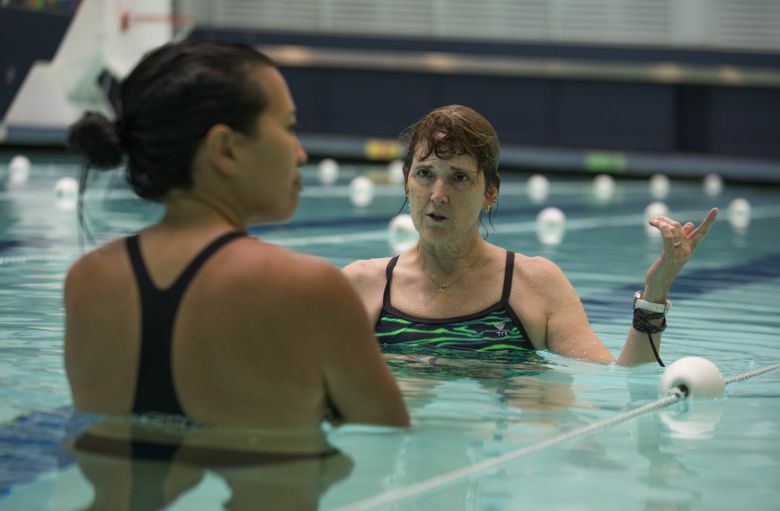 She has a couple of shifts per week, rotating 30 minutes at each of the two pools at Bellevue Aquatic Center, with a 30-minute break during the shift when she can swim. You have to stay in shape to lifeguard, she said. “You’re sitting here, but if something happens, you have to get across the pool quickly,” said Flood, 54. The center has monthly classes for lifeguards, where they practice rescues and keep skills up-to-date. If you were once a lifeguard, or are a swimmer who wants to put your skills to use, Flood is an example of how you, too, can do it again. And you get paid to work out — I can vouch for that as a job choice. Nicole Tsong teaches yoga at studios around Seattle. Learn more or reach her at nicoletsong.com. Steve Ringman is a Seattle Times staff photographer.